Caterpillar surpasses all expectation by meaningfully up to dating the propeller series n. 3500, number to which the letters C HD has been added since HD means High Displacement. The news about it concern six different propellers inside the same line whose design features a power increasing up to 21% by comparison with the previous versions. 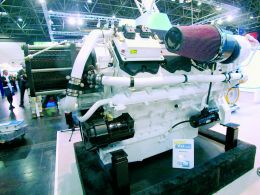 The new Caterpillar props series offers to mega-yachts building yards the opportunity of featuring highly performing engines at relatively low costs. Moreover, power increasing has been achieved by new hardware packages and management software developed inside the "ACERT Technology " project, created and managed by the firm in effort to bring out maximum performances from its props. Since the new 3500 series prop technology began to be used, one of the effects immediately noticeable was the increasing of rpm up to today's 1.800, without compromising the reliability and without recording emissions increasing, always monitored by computer. The ACERT technology avails itself of new hardware packages featuring, for example, new injects with variable - angle jets, new combustion chambers, a new in - exhaust modular system, high performance turbines and introducing a new so - called A3 ECM and a new cooling system. There are two new engines with various operational ratings available as follows: 3516C-HD and 3512 C-HD. The former is a 16 cylinders V60° four - strokes diesel engine with a maximum cubic capacity of 78.000 cu centimetres and net weight of ca. 7.850 kilos, able to provide a maximum power of 3.435 HP at 1.800 rpm; the former is a 12 cylinders V60° engine with a maximum cubic capacity of 58.600 cu centimetres and a net weight of 5.554 kilos, able to provide 2.575 HP at 1.800 rpm. Thanks to its size and structure Caterpillar Inc. can carry out very complex and challenging developing research projects regarding either financial or human resources at its disposal and resulting in the latest technology applied to the 3500 series propellers. 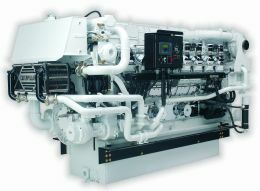 In effort to make known the Caterpillar's production capability in engineering field, if still unknown, it is note worthy that this firm can produce either engines whose power can vary between 15.000 and ca. 22.000 HP or world - widely known turbines and machine tools. Since more than 75 years Caterpillar Inc. is involved in developing their manufactures as well as an adequate, world - wide sales and assistance network being actually able to rely on a widespread presence in all continents and on a business volume of roughly $25/30 billions. It is not to be excluded that this technology, resulting in developing the series 3500, may be in short time also applied to other Caterpillar's production lines in effort to put on the market new - generation, even more powerful, clean, reliable propellers.